KM’s ongoing “geological survey” entails cutting trees and boring holes deep into the mountain, and protesters have been occupying the work sites despite injunctions. 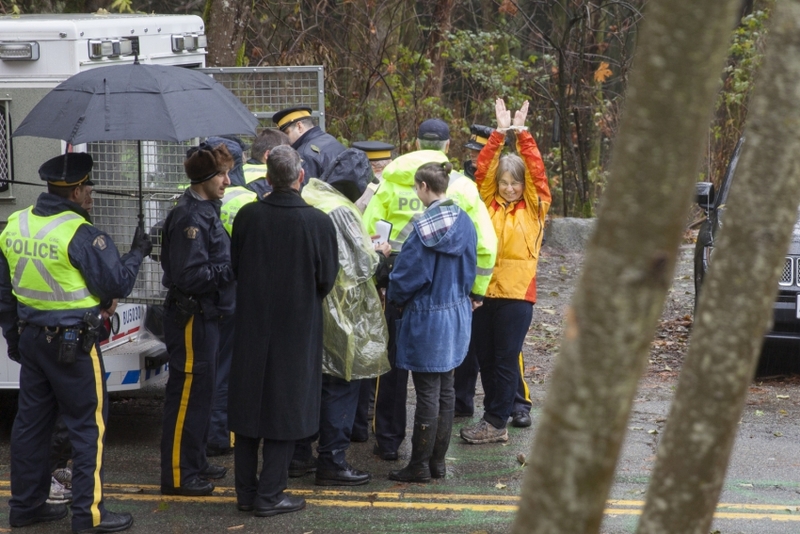 On November 21, Lynne stepped across a police line and was arrested. She and others also face a lawsuit from the company. The NEB (National Energy Board) process is now a sham…We have a process that does not allow consideration of climate change…at a time that climate change is the biggest problem facing humanity. It’s unethical. The new NEB Act is written as requested by the oil industry. At the end of the day when you’re dealing with unjust law and abusive power, the last resource we have is civil disobedience. It’s done in full respect of the rule of law. But it’s also done with serious responsibility with being a citizen in this country. So now, I’m going to turn around and walk up this hill — and be the best citizen I can be.